Target 4: Homelessness | Propel L.A.
Homelessness is a chronic and salient issue that impacts all 88 cities and 100+ unincorporated areas within LA County. While sustainable solutions may seem inaccessible given the severity of homelessness in the county, recent public policy and objective data show signs of hope. In March 2017, the county voted to pass Measure H to fund homeless services and prevention through an increased sales tax. A major goal of Measure H is to permanently house 45,000 homeless people by 2022. According to results from the 2018 Los Angeles Homeless Services Authority (LAHSA) homeless count, countywide homelessness decreased in 2018 – the first time since 2009. (Figure 7) Homeless count decreased for the first time since 2009 in 2018. 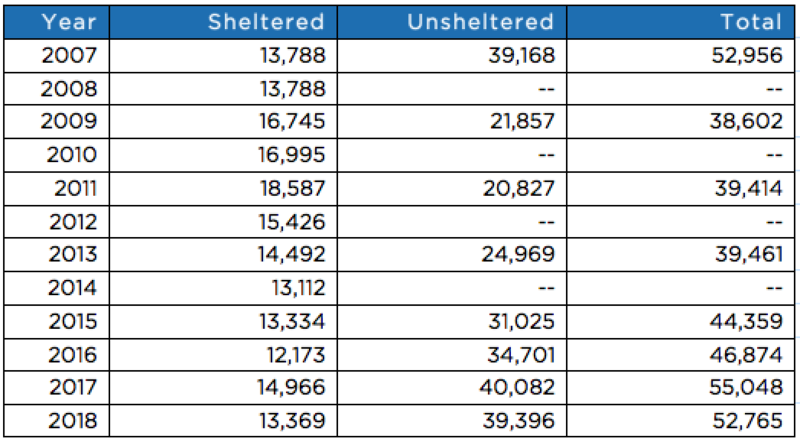 Prior to 2015, the Los Angeles Continuum of Care (CoC) only did full homeless counts (sheltered and unsheltered) in odd years. However, they have conducted sheltered counts every year since 2005. Los Angeles County’s Homeless Initiative and United Way of Greater Los Angeles, Propel L.A.’s lead partners on the homelessness issue, used July 1, 2017 as the time of reference for measuring progress under Measure H. Given the 4.5 years between July 1, 2017 and January 1, 2022, Propel L.A. has determined that LA County must move 10,000 homeless people to permanent homes per year to stay on track for Measure H.
Based on Measure H, we hope to see at least 35,000 homeless people housed permanently by the end of 2020. For more about homeless count, see Lorin Kinney, Senior Analyst of Data & Research at Los Angeles Homeless Services Authority (LAHSA). Data for 2005 only includes LA CoC and excludes the cities of Glendale, Pasadena and Long Beach while data for 2006 does not exist in the HUD Homelessness Data Exchange (HDX) system; therefore, Propel L.A. did not include 2005 and 2006 in our research. Data for 2014 is inaccurate per Los Angeles Times (http://www.latimes.com/local/la-me-homeless-numbers-20140705-story.html).